Marietta, OH – Last year a huge collaborative effort, geared towards education, innovation, and economic development, took place in Marietta’s very own back yard. The Career Center – Adult Technical Training has implemented a brand new facility on its main campus called The Outdoor Industrial Facility. The outdoor facility already has a proven track record for a positive impact, despite it being in its early stages. The Outdoor Industrial Facility simulates an environment found in any industrial plant in the United States. Students who are interested in technical fields, such as, Chemical Operator, Instrumentation & Electricity (I&E), or Industrial Maintenance, are able to gain knowledge of what they will be facing on an industrial plant site, while in a safe and controlled setting. This controlled setting gives students the opportunity to learn safety protocols and how to respond to potential risks associated with chemical operations. The system allows instructors to simulate different scenarios at the facility, including chemical leaks, spills, confined space entry, and valve replacements. In these simulations, students must respond in the appropriate manner according to the instruction they have received. After each simulation, instructors are able to evaluate and critique how the students’ handled each scenario. In this way, knowledge is converted into hands-on experience. Another unique function of this facility is the fact that it is outdoors. Running these simulations in various weather conditions prepares these students for situations they will encounter in their profession. Though this new outdoor facility is located at the Career Center, it’s not just students who are benefitting from its development. 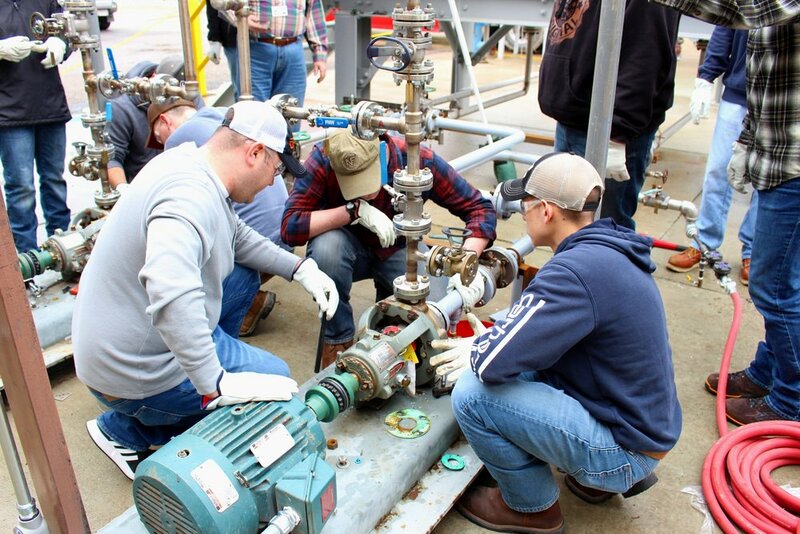 In January 2019, the outdoor facility reached a milestone when it provided training to 18 newly hired Kraton employees. Custom training for companies will be offered by the Career Center. Greater education, instruction, and exposure to safety protocols will help workers develop their skills and knowledge of potentially hazardous areas. These trainings will not only produce safe habits and instruction for local chemical plants, but it will also help keep the surrounding communities safe. The Career Center estimates 150 or more people will be trained at this outdoor facility in the first year. Many representatives from local chemical plants serve on the Career Center’s advisory board. As representatives, these plants help set the programs’ curriculum and competencies. By collaborating with the local plants, the Career Center has seen high job placement rates among their program graduates. “Having this facility will only solidify and enhance our ability to place people,” said Huffman. The initial idea for this outdoor facility was proposed in October 2016 during a Career Center advisory board meeting. Immediately the faculty, staff, and committee members saw the value in this proposition. The idea soon came to fruition and construction began in January 2017. To help with cost and garner community collaboration for the project, the Career Center staff approached a group of local funders: Marietta Community Foundation, Parkersburg Area Community foundation, The Ross Foundation, and The Bernard McDonough Foundation. After receiving grants from these local funders and donated equipment from local plants, the outdoor facility became operational in 2018. Students then began training for various programs available at the Career Center, utilizing this new facility. The program is now entering its second fund-raising phase. The funds raised in this phase will be dedicated to converting the outdoor facility from a manually ran operation to a modern automated operation. With the facility generating so many positive outcomes, other funders and plants have already begun to donate equipment and money for the second phase. Many see this program as widely beneficial to our region.